Graduating is a cause for celebration and a major achievement in a persons life to graduate from anything, specifically high school or college. 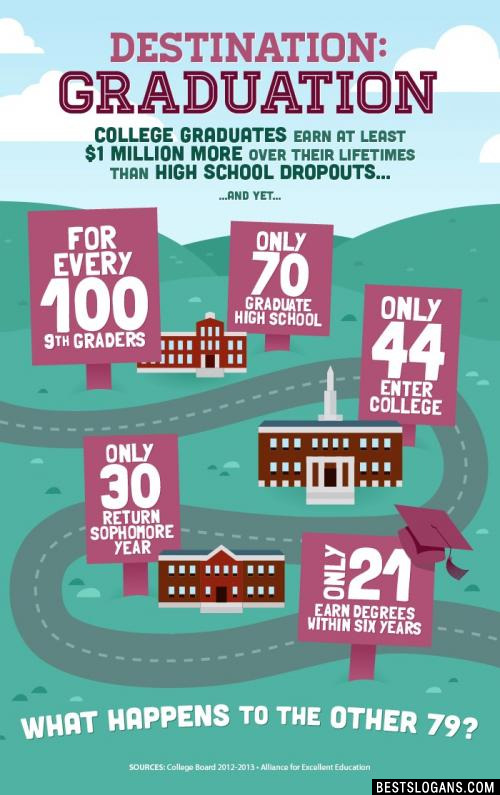 Here are a few facts related to school. The word "alumnus" is Latin meaning "a pupil" and, literally, a "foster son." The term "college" is from the Latin collegium meaning "community, society, guild" and, literally, "association of collegae". It was first used to describe an academic institution in the late fourteenth century in relation to Oxford and Cambridge. "University" is a shortening of the Latin universitas magistrorum et scholarium or "a community of masters and scholars." Congrats to you and yours class of 2017! Here are some wise words to always remember and take with you along your journey from the late great Steve Jobs: "Your time is limited, so don't waste it living someone else's life. Don't let the noise of others' opinions drown out your own inner voice. And most important, have the courage to follow your heart and intuition." What a time to be alive! 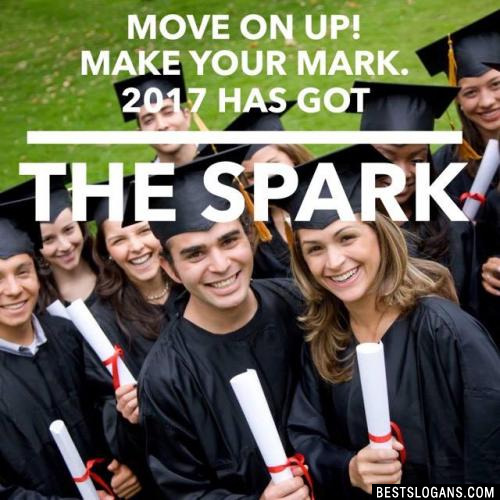 Here's we've put together a great collection of slogans and class of 2017 sayings for your t shirt, poster of school ad campaign. Enjoy! 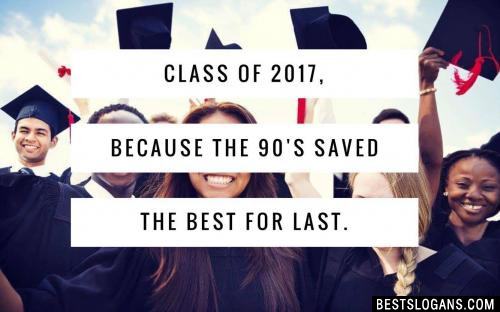 Class of 2017, because the 90's saved the best for last. 3 Ahead of the rest, the class of 2017 is the best. 9 Im So Looking Forward to Missing All This! Class of 2017. 11 Life might not be the party we hoped for; but while were her make it last Class of Seventeen. 12 You Don't Wait for Your Dreams to Happen, You Make Them Happen. Class of 2017. 13 Class of 2017 - So Done! 15 It's Been Hard To Look Busy for 12 Years. Class of 2017. 17 United We Stand. Divided We Fall. 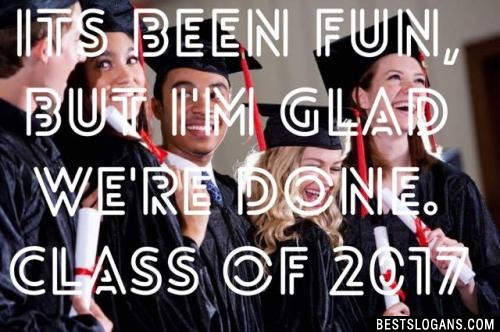 Class of 2017 Got It All. 19 Step Aside While We Rock the Scene Were The Class of 2017. 20 Keep Calm and Graduate. Class of 2017. 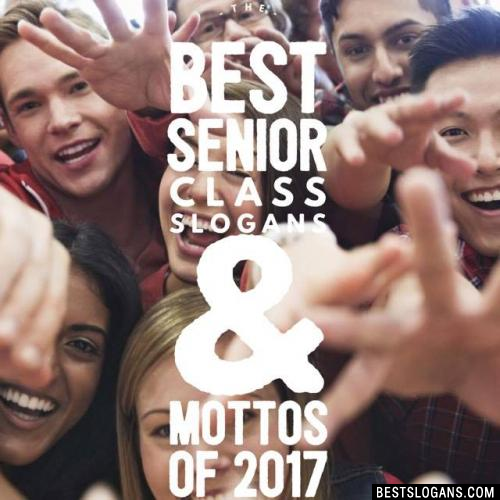 Can you think of a good Senior Class Of 2017 Slogans For Shirts we're missing? Or come up with a clever one of your own. Please share below.